I'm sorry that I've been a bit quiet lately but sadly life's been keeping me out the kitchen and out of touch. Spring is finally here but, before we forget about the need for warming beef casseroles during the colder months, here's one of my favourite comforting beef dishes - although this recipe works at any time of the year, honest. My version sticks fairly close to the classic Carbonade Flamande recipe, or at least to the one I learnt in the Nord-Pas-de-Calais. There are plenty of variations around so please don’t shout at me if it doesn’t sound authentic or even truly ch’ti to you. The problem that I have with a lot of beer-based casseroles is that they can become too bitter for my taste. The clever thing about this dish is that the flavours are balanced by adding pain d’épices, which not only adds sweetness, but also adds a gentle hint of spice and helps to thicken the sauce. If you can’t find pain d’épices then you could make your own (my recipe is here) or you could use a slice of ginger cake instead, perhaps with a little honey added to the mustard. Opinions can be deeply divided on which type of beer to use for this dish. The version I first came across used a bière blonde and I stick to that because I know it works well for me. I used a Belgian beer on this occasion but there are a number of British and French beers available that are brewed in similar ways and will work just fine. Preheat the oven to 140°C. In a large, lidded casserole dish, brown the meat in batches. To do this you could add a little oil or butter to the dish, but I was told that traditionally you should always use lard and I’m not arguing. Once browned, set the meat aside, add a little more fat (well OK, lard) to the dish if it needs it and fry the onions, leek and carrots gently for around 10 minutes. Stir regularly and don’t let the veg burn or darken too much. Stir in the sugar and vinegar. Put the meat back in the casserole and season with a little salt and a generous amount of pepper. Pour over the beer and tuck in the bouquet garni. The beer should just cover the meat. Spread the mustard generously over both sides of the pain d’épices and nestle it down in amongst the meat and veg. Bring up to simmering point then lay a sheet of dampened greaseproof paper directly on top of the mixture, put the lid on the casserole dish and place in the oven. Allow the carbonade to cook for 3 hours. After this time, the meat should be very tender and the pain d’épices should have dissolved. Discard the bouquet garni and give the dish a thorough stir to ensure that the flavours are combined and the pain d’épices thickens the sauce evenly. Personally I like this dish served with mashed potato, especially if there’s some mashed celeriac mixed in with it. I'm told that chips might be more authentic, though. 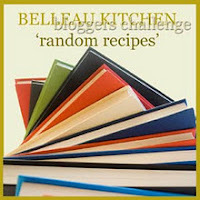 For the March Random Recipe challenge Dom of of Belleau Kitchen has given us the number 17. I went to the least used shelf of the bookcase (the top one) where the 17th book was ‘The Hudson River Valley Cookbook’ by Waldy Malouf. This book was published in the nineties, which is when I got hold of a copy, but I haven’t opened it in quite a while. Maybe I’ve been led astray by books containing more glossy pictures by chefs with glossy TV shows but more fool me, because there are some excellent recipes in this collection. The book opened at the page for Onion Walnut Muffins, which is probably because there was a piece of paper stuck in it at that point. I think I'd put it there years ago when I thought about making them but never got round to it. Maybe that’s not truly random, but having read the recipe, I really wanted to give them a go. The muffins are intensely savoury and make a great alternative to bread alongside any number of dishes. I’m sure they could also be adapted with judicious use of other nuts and one or two spices. I can’t say that every Random Recipe challenge has resulted in a dish that I’d make regularly but there are a number that have. This is definitely one of them. Following a little bit of searching, I’m happy to report that you can find the original recipe here. The original recipe says that it will make 20 muffins. Actually, I’d say that it makes 20 mini-muffins. For me, the amount given made 12 medium-sized muffins. I think that’s not a bad size to choose, although the mini-muffins would be great as appetisers. I found that the muffins cooked a little more quickly than the recipe suggests, so keep an eye on them. I’d advise against mixing these up with sweet muffins. Getting one of these savoury little treats with your afternoon cuppa might come as a bit of a shock. I wasn't sure how to describe this dish but, in case you haven’t come across it before, let’s say that it’s a light and subtly flavoured flan-type thing and that it makes a very pleasing and simple dessert. It’s a traditional recipe from the Charente or, at least, that’s where I first heard of it. Since then I’ve found that there are many similar recipes from various parts of the south of France. They all have maize flour and eggs in common although there are plenty of other variations. If you’ve read any of the other posts in this blog you might have gathered that authenticity is not something that I worry about too much, so I certainly wouldn’t claim that this is the real deal. My recipe is closest to the Charente version (well it has cognac) but is actually a bit of a mix between a number of the recipes that have fallen into my lap. Anyway, it’s the way I like it – very eggy, fairly sweet and with a balance of lemon and cognac flavours. I hope that anyone I know in the Charente will forgive me. Butter a 22 cm cake tin – a springform tin is probably the easiest. Preheat the oven to 190°C. Sieve the two flours together. Heat the milk, cognac and lemon zest in a saucepan until nearly boiling. Pour the hot milk mixture onto the flours while beating as if your life depended on it. Beat in 100 g of the sugar followed by the butter. Finally beat in the egg yolks one at a time. In a separate bowl, whisk the egg whites to the soft peak stage and then whisk in the remaining 40 g of sugar until the whites are stiff and glossy. Fold the egg whites into the milk and flour mixture – you need to be thorough but gentle. Pour the mixture into the tin. Bake for 30 – 35 minutes until the milla has set but is still a little wobbly in the middle and is nicely light brown on top. Turn off the oven and let the milla stay in the cooling oven for 10 minutes or so. Le milla Charentais should be served warm I've been told, although personally I rather like it at room temperature.